In 2009, the idea of a well-adjusted, self-realized pop star tends to boggle the mind of the American public. 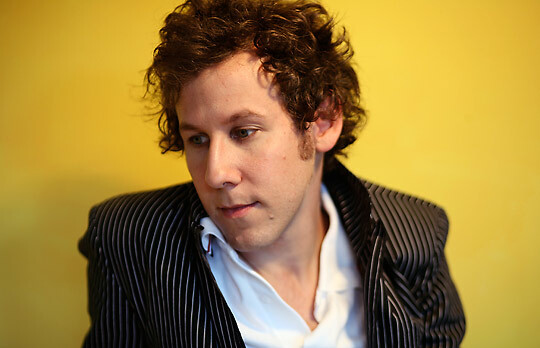 Ben Lee, a 30-year-old Australian singer/songwriter, has lately been on a mission to deliver music that challenges the notion of guilty-pleasure pop by creating radio-ready songs that also encapsulate ideas about politics, identity and gender. The Rebirth Of Venus (out in April on New West), Lee’s seventh solo album, is his ode to feminintiy in all its guises: muses (“Yoko Ono”), compassionate politics (anti-Bush Doctrine “Wake Up To America”), gender role-playing (“Boy With A Barbie”) and just wanting to have fun (“What’s So Bad (About Feeling Good)”). Venus is a brave and positive statement from Lee, a 16-year veteran of the music biz (he started out in teenage pop/punk outfit Noise Addict) who recently married actress Ione Skye (daughter of ’60s folk icon Donovan and iconic in her own right for her starring role in Say Anything). Lee answered MAGNET’s questions from the green room of The Tonight Show With Jay Leno, where he performed on Friday. A man of spiritual depth and professional accomplishment, Lee will be guest editing magnetmagazine.com this week. The Rebirth Of Venus seems to follow the same prime directive that you had with (2007’s) Ripe: make a pop album and don’t pull any punches. Or, as you put it in the first song, “no guilt, all pleasure.” Is that an accurate read? In a sense, but I’ve always been interested in pop music that is kinda subversive or left field while still being accessible. I think the ideas on the records are definitely not typical of a pop record or song you might hear on the radio these days. At the same time, a song like “I Love Pop Music” is something that works on a lot of different levels. I have to admit I’m confused by its juxtaposition of lighthearted pop music and the lyrics about geopolitical instability and overpopulation: Are you demonstrating that messages can be hidden in pop songs, or are you criticizing preachy artists who can’t leave a fun pop song alone? Like every song, it’s an experiment. There isn’t really any sarcasm in the song—I love bubblegum pop songs and I care about the big issues we are facing on this planet right now. When I put the two together, something cool happened. It created a tension and subtext that confuses me, too. I think that’s why I like it. I like that “Yoko Ono” tells the other side of an often-lopsided story: that Yoko didn’t take John Lennon away from Beatles fans; she actually kept him going, kept him inspired and alive. Yeah, she was subject to a tremendous amount of both racism and misogyny. And while there is an argument that can be made about John’s interests taking him away from the Beatles, it could also be argued that there are more important things in life than keeping a band together. The search for personal truth, emotional alignment and true love are very big things to make contact with, and I’ve always applauded him for following them. Obviously there are a lot of different takes on femininity throughout the record, and part of the message I think you’re conveying is that men need to recognize their feminine traits as well. What’s been the most difficult feminine trait for you to embrace? I think success is something I have often defined in very masculine terms: how many records sold, how big the crowd is, how many websites say you’re cool. It’s a competitive way of measuring things. I am trying to embrace a more feminine approach to examining my definition of success, it being more about feeling than numbers. I feel like Chris Eigeman in Barcelona saying this, but it’s my patriotic duty to take exception to “Wake Up To America” and its claims that our foreign policy is uncompassionate and that we’re empire-building. I suppose it might ruffle some feathers. I’m a very patriotic person to both Australia and America. I moved to America 12 years ago because of the opportunities that it presents, and I’ll always be grateful for those. However, America also has a lot that it has never been called to account for and should take responsibility for. There is a reason that many people around the world feel alienated by American foreign policy; it’s not just that they are crazy or jealous of democracy. I just like dialogue about these things. That’s the only way to move towards truly fulfilling the potential of the American dream, which is something I actually deeply believe in. You and Ione were married in India in December. The photos on your blog look beautiful; can you tell us a bit about the ceremony? It was a traditional Hindu ceremony officiated by Sakthi Narayani Amma, who is a saint living in Tamil-Nadu. It was amazing. About 50 of our family and friends were there, and we took everyone to the local orphanage at night to put on a talent show for the kids and feed them and give them gifts. And I got to marry my best friend. It was awesome. What can you tell us about the recording of a new Noise Addict album and the long-running mix-tape album you’ve been working on? All that’s left to do on the Noise Addict album is Lou Barlow’s bass parts, which we do in a couple of weeks. It’s chaotic home-recording mistake-pop. I love it. I just needed to make some music that was all me with my own quirky sense of unprofessionalism. I don’t know if anyone else will dig it but i’m really proud of it. The mixtape is a record I made with Squeak-E-Clean (N.A.S.A., Yeah Yeah Yeahs) where I wrote all the songs and we got lots of different singers to sing them. People like Kylie Minogue, the eels, Neil Finn, Zooey Deschanel and the Sleepy Jackson. If you could bring back any woman from history—someone the world needs to have around—who would it be?